A relatively newly recognized, important player in the stem cell field is a molecule called histone variant H3.3. Histones are key components of chromatin with integral roles in regulating almost all aspects of cell behavior through orchestrating functions such as transcription and chromosome segregation. My lab has just (April 9) published new studies on histone H3.3, the first of their kind on the endogenous histone H3.3 protein in mammals. The work was supported by CIRM and NIH. Much of our work was based on a handy tool that we made, now available for the field, for figuring out how H3.3 works: histone H3.3 knockout mice. Two genes, H3f3a and H3f3b, normally make identical H3.3 protein. We knocked out the H3f3b gene and found that mammalian development along with a host of cellular functions are substantially changed. Cells and embryos really do not like losing even just some of their H3.3. Unlike the garden variety canonical histone H3, which can only be deposited onto chromatin in a replication-dependent manner linked to DNA synthesis, histone variant H3.3 is far more flexible. It can be deposited into chromatin any time regardless of the phase of the cell cycle. What this means is that H3.3 can in theory change the chromatin and epigenetic state of cells in far more dynamic and interesting ways than its sibling, the canonical H3. Interestingly, Nobel Laureate John Gurdon published a paper about six months ago showing that H3.3 is required for cellular reprogramming by regulating dynamic transcriptome states in Xenopus. In our more recent study we found that for many mouse embryos, the loss of half or more of their H3.3 protein due to the H3f3b gene knockout led to lethality even though the related H3f3a gene was left untouched. It was notable that some mice survived to adulthood despite losing H3f3b. These surviving knockout animals were generally infertile, strongly implicating histone H3.3 in fertility as some previous studies have indicated including in Drosophila. When we studied mouse embryonic fibroblasts (MEFs) that lacked the H3f3b gene we found that they frequently had very little H3.3 protein indicating that H3f3b may be responsible in those cells for making more H3.3 protein than the H3f3a gene. The H3f3b knockout cells exhibited a range of problems: chromosomal abnormalities including some very rare ones (more below); cell cycle problems suggesting the cells tended to get stuck in mitosis; chromatin bridges (where not all the DNA during cell division makes it into one daughter cell or another so there is a “bridge” of DNA between the two cells (see image above at the top of the post); and some moderate changes in the overall epigenome and transcriptome. One of the more interesting changes (extremely rare in normal cells) in the knockout MEFs was endoreduplication, a chromosomal condition in which a cell duplicates its DNA, but does not successfully go through mitosis. Often times the end result is a sort of double butterfly-like appearance of chromosomes (see image at right). Just why lowered levels of H3.3 caused endoreduplication remains to be determined. Given the previous literature on H3.3 suggesting a key role for it in globally regulating the transcriptional activity of genes, we were surprised that our analysis of gene transcription in the H3f3b knockout MEFs showed only a moderate number of changes. We also only observed moderate changes in the global distribution of histone H3 that is trimethylated at lysine 4 (H3K4me3), a marker of actively transcribed genes. We did these studies with a neat technique called ChIP-Seq that provides a global picture of where specific histones are in the genome. One possibility explanation for the relatively mild phenotypes at the transcriptome and epigenomic levels in our knockouts is that remaining H3.3 protein made from the sister gene, H3f3a, was just enough to in essence obscure these functions of H3.3 in the H3f3b knockout cells. It is also possible that other histone-like proteins such as CENP-A, a centromeric protein in the H3 family, filled in for the lack of H3.3 specifically at genes. 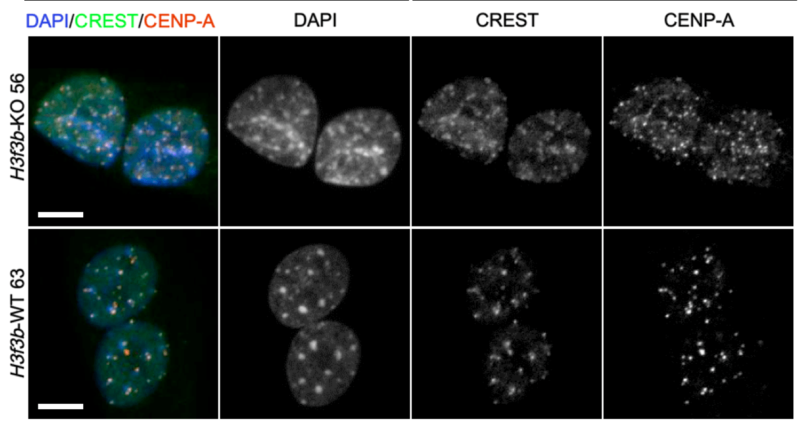 We did observe in the knockout cells that CENP-A protein was substantially mislocalized, but that could also be a result of H3.3 somehow being important for the normal placement of CENP-A on chromatin rather than CENP-A filling in for the lost H3.3. Or perhaps some of both. See image above. Note that CREST is a human serum that stains CENP-A and additional centromeric proteins. The knockout cells also have more and brighter DAPI staining indicative of increased heterochromatin. Overall, it seems that studying this very intriguing molecule, H3.3, has a lot more to teach us biologists. Other histone variants ( see papers here, here, and here) are also likely of key importance to development and stem cells. Such histone variants may give cells including stem cells epigenetic flexibility and hence flexibility in their behavior. Awesome and important science. Great work, can you find out what happens if it is not completely knocked out or compromised? Would knowledge of the role of histones tie in to stem cell safety? What does this look like in disease where neuro-degeneration is a problem or is this too many questions too soon?